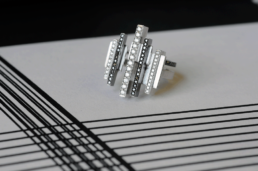 Joy wanted to Amanda to create an architecturally inspired statement ring that was both elegant yet strong in geometry. Amanda found inspiration from the Art Deco skyline of lower Manhattan and designed a miniature cityscape in its own right. Appropriately named the Astor ring, the piece brings the glamour and style of a bygone era into the 21st century.